Anastasia Bordeau paints the Night. Still, the first thing in her paintings that strikes the eye is the absence of natural lightning. The firmament with moon and stars has totally vanished from her horizon: space has lost its sublunary nature (hypaithrios), even as a tangible presence of the earth, the ground is, on the contrary, stressed by the traffic signs. 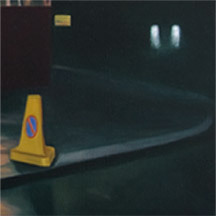 Headlights and lampposts transpierce the gloom, while neon lamps with their sharp, pointed beams paint the night by white, yellow, green splashes of varying intensity. No haze, no glimmer anymore, but the primordial Colour standing out against the Shadow. Another characteristic feature of the series is the absence of Man. It’s this very trait that so conspicuously distinguishes them from the artworks by Edward Hopper (1882-1967), the painter hardly to be omitted in the context. In his paintings, such as «Night Windows», 1928 (Museum of Modern Art, New-York) and «Night Birds», 1942 (Art Institute, Chicago), human figures arrayed in clinging garments stand motionless, as if under a spell. Peeping out through the display windows his personages flaunt their passivity and uncommunicativeness, still, they are undoubtedly human, men or women. Bordeau’s world is just the opposite: her benches, cars, cafes, filling stations have never stood for a journey, an action, or a sign of ordinary life. This world is at least for a time deserted, devoid of human presence. After all, the third feature one can’t help referring to is the total absence of any plant or animal life. We are plunged into the depths of mineral world where triumphs the glass with its playful ability of optic effects – now transparent, now smooth. Could the trap be avoided? «Beware, Danger!» And so warns the train of brown signs flattened in S-shapes: stop needed, otherwise you could stumble on an invisible surface; they indicate the dangerous proximity of the edge. No stars, no people, no plants... The night of Anastasia Bordeau is urban and deserted at the same time, yet it lacks disquiet or unease. Quite the reverse, this night is pretty snug, bringing back the intimacy of mother’s womb where you can hide and escape all troubles. Here we are plunged into the shadow, stay sub umbra, as Hugo put it; but the obscurity of this shadow (Umnachtung) keeps its affable spirit. It’s neither the night that emanates discomfort, nor the eyes of street lights and cars. Uneasiness is rather the effect of broad, sharp light that illuminates half-naked, often dismembered bodies: smooth, cold and beautiful, but frigid; those bodies on display are often inappropriate, excessively lush, overly academic. They look like the candid advertising images exposed not for pleasure, but for sale. A recurrent motif in Anastasia Bordeau’s works is a transparent glass cage where the bodies are enclosed whether it be a telephone box or a bus stop shelter. Despite the welcoming whiteness of a bench, those cages reject any possibility of encounter. The Temple of Present Tense, the Temple of Today Life – it’s the place where there is no place for true sensuality, whilst insolent luxury runs the show. It is the Temple of Heartless Symbols and Love Profaned, the Temple or, if you wish, anti-Temple of Luring Lust – anonymous, for sale together with the neon city lights. This cult of semblance without existence seems to have torn away from things all the tokens of intimacy and turned them into mere illusions. Let us imagine the temple of Aphrodite of Knidos, the masterpiece of Praxiteles, evoked by Pliny the Elder: the elders didn't hesitate to evoke the physical love which seized some men, dazzled by the statue of the goddess. Even when the statue was damaged, they would still pay it homage. However, the world of Anastasia Bordeau is abandoned by gods and free of any worship, as well as love. Sculptures with their volumes are substituted by flat images you can’t take seriously, advertising bereaved of sense and allure because of the void around, yet still obtrusive. The Artist’s Universe looks like a cinema without audience. One of her most ironical paintings shows doubled image of female body bottom on the side of a telephone box; the intimate part is covered by a chequered scrap crossed by a vertical white line. And this notwithstanding the neighbouring entrance to the cafe with chairs turned and a Ready-to-Serve sign. Rose and poignant red colours make the black space bleed. Smooth canvas surface and strict composition do nothing but accentuate the idea of violence, by way of subliming it. Even the asphalt can’t help blazing. Could the speed bring salvation? Bright silhouettes of glass boxes are confronted by the dark shadows of cars with only their head and backlights to betray their presence. Where do they go? Where do they come from? They are Night’s allies dropping the hint of its power. ‘Ah, that I were night’, cry we out the words of Nietzsche’s3 Zarathustra. To be night is to go into the shadow, to give a free course to the longing of otherness, to follow the metamorphoses of this endless darkness similar to the primordial chaos. Away from the Present turns our desire heading towards the Future, discarding the time yet uncompleted, progressing and apparently omnipotent. 1. Pline the Old, Hist. nat., book XXXVI, 21, transl. P. Bloch, Paris, Belles Lettres, 1981. 2. Lucian, Amores, 13, cited by Jackie Pigeaud in Praxitèle, Paris, Dilecta, 2007. 3. Nietzsche, Nachtlied, in Thus spake Zarathustra, 1883, Stuttgart, Kroner, Taschenausgabe, 1964.